This dripline is a 1/2" (.600" ID X .700" OD) black oval, pressure compensating drip line with in-line drip emitters that provide high uniformity and even distribution of water over longer lengths and uneven terrain. May be hung on a wire, laid on the ground or buried, making it an economical choice for vineyards, orchards, and row crops. As with our blank poly tubing, additional PC emitters and/or 1/4" micro line can be added to this drip line. When adding additional drippers, take care not to exceed the maximum flow rate (200 GPH) for this size tubing. Very effective method to irrigate crops in difficult topographical conditions, low and varying water pressures and where longer laterals are required. 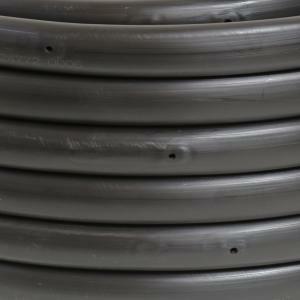 This drip line is an oval poly tubing, and is compatible with our 1/2" Perma-Loc fittings.